‘고객 경험’에 초점을 맞춘 다양한 서비스를 시도하고 있는 오설록에서 카페형 로드샵인 ‘티하우스’에 이어 백화점 매장인 ‘티샵(TEA SHOP)’에도 새로운 디자인을 적용하였습니다. 티 하우스에 비해 작은 규모이지만 다양한 종류의 차를 전문적인카운슬링과 함께 직접 시음하고, 시향 하며 즐길 수 있도록 하였습니다. 제주의 청정 지역에서 정성스럽게 만든 오설록의 차 제품을 경험할 수 있도록 매장의 컬러를 최소로 하여 차분한 느낌의 베이스에 새로 리뉴얼된 화려한 그래픽의 패키지들이 하나하나 돋보일 수 있도록 진열하였습니다. 또한 최고급 수제 녹차인 MASTER’S TEA 라인의 패키지들은 별도의 공간을 두어 브랜드 스토리와 함께 오설록 녹차의 우수성을 보여 줄 수 있도록 기획하였습니다. 티 하우스에서 이미 선보인 바 있는 제주 오설록 차 밭의 모습을 형상화한 곡선이 겹쳐진 형태의 케노피 디자인과 제주 흙의 컬러감, 돌을 쌓아 놓은 듯한 선반의 모습들을 제한적인 공간이지만 표현하려 하였고, 매장 중앙에 실제 녹차 잎을 건조하여 진열해 제주의 척박한 땅에서 자란 녹차 밭의 푸르른 모습을 조금이나마 느낄 수 있도록 하였습니다. 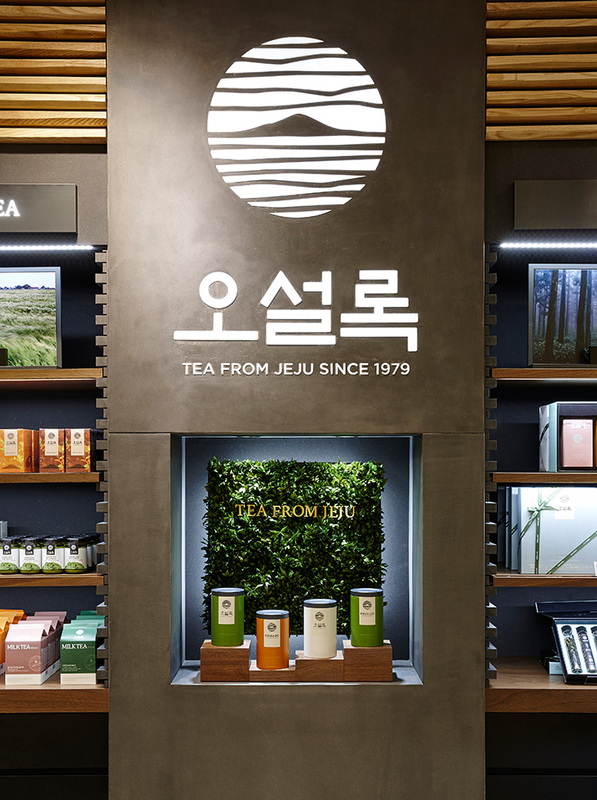 Following “Tea House,” the café-style shop operated by O’sulloc highlighting “customer experience,” “Tea Shop,” a store inside the department store, also adopts a similar approach. Tea Shop is small in size compared with Tea House but is designed for customers to enjoy the tastes and aromas of various kinds of tea with the help of professional counselors. 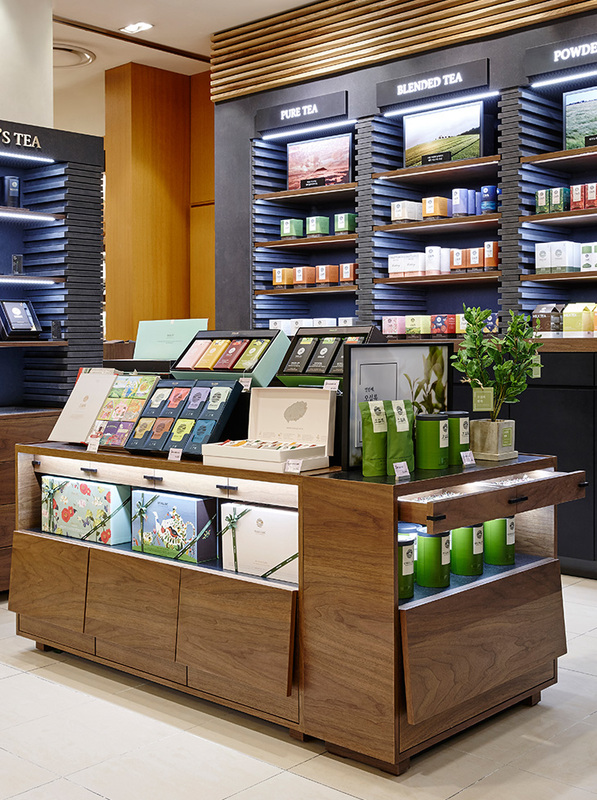 In Jeju’s eco-green region, the color of the store is kept minimal to enhance the experience of tea handcrafted by O’sulloc. In the subdued backdrop, products are displayed one by one so that the newly updated elaborate graphic image can appear attractive. 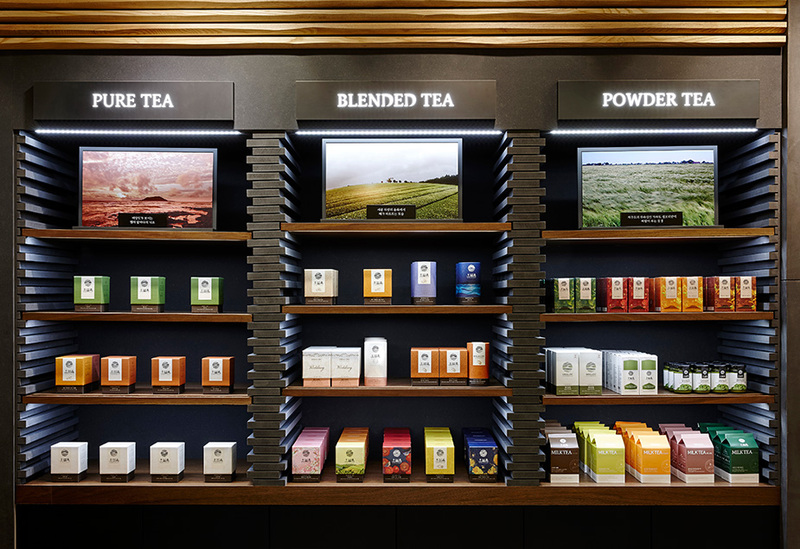 There is a separate space reserved specially for the Master’s Tea line, the brand’s most luxurious handcrafted tea; thus effectively showcasing the excellence of O’sulloc green tea along with the brand story. As was already shown in Tea House, the canopy design featuring overlapped curved lines that graphically embody the scenery of O’sulloc tea plantation in Jeju, the color inspired by dark volcanic stones of Jeju, and the shelves designed to mimic piled Jeju stones are interior elements making up the limited space. 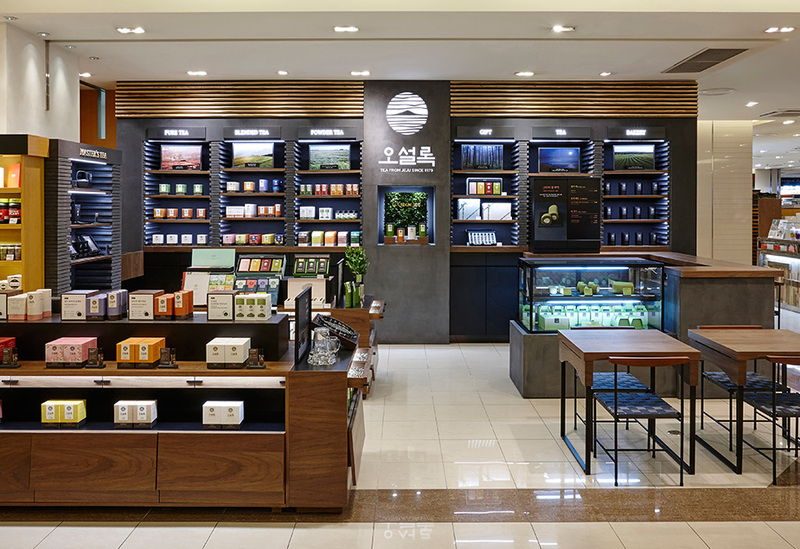 Displayed at the center of the store are real dried green tea leaves to inspire visitors to visualize the green field of tea grown in the once barren land of Jeju Island.